Wow, it has been a while since you posted a pizza recipe and I am loving it! Girl you are so creative with your toppings and so inspirational! Now I know I am making pizza for dinner tonight! Thank you!!!!!!!!!!!!! I love the balsamic glaze. The zigzag is mesmerizing. I need this, like, now would be great! Gorgeous photos, as always. Balsamic glaze makes anything about 1000x better! PS – The BSB just got a star on the Hollywood walk of fame. It’s about darn time if you ask me. I have the world’s best balsamic, and I’ve been putting it on just about everything (including ice cream). This looks like another good use for it. How can you go wrong with pizza? Looks delicious!!! The cherry on top is the balsamic glaze! Amazing! This is such a fresh take on veggie pizza. I often avoid them because they lack body but with the balsamic, I am willing to give them another go. I first thought the mushrooms were purple potatoes (idk why…) and now I think adding those into the mix would be wonderful too! This looks delish. Sign me up for anything with balsamic glaze! In fact, I could probably eat a pizza with balsamic glaze instead of pizza sauce. Totally. Addicted. Oh and feel no shame about the BSB and Britney stuff – I have several throwback playlists in my iTunes which get played regularly (and in honour of Throwback Thursday tomorrow, I might just load up a new one!) Have a great day Jess! Balsamic glaze! Roasted asparagus! Cheese! Yes please! Let’s take a step back for a minute… he was singing to Britney Spears?! lol Also… this pizza is pure genius. I have three guilty pleasure stations that I listen to on Pandora – Backstreet Boys being one of them. (Hall & Oates and Whitney Houston are the other two). But is it still a guilty pleasure if I’m not embarrassed about it? Girl you are too funny. FANTASTIC pizza! Just had it last night and it was to die for. Keep up the good work (and bsb/bs singing)! I say post your recipe every time, but that’s just me. Makes one less piece of paper to print…but that’s just me. Also..this looks glorious, that is all. So I think the thing I’m most excited about is this glaze. I think I could put balsamic glaze in a glass with a straw. Is that weird? I didn’t ever think I would say this, but I think I may like prosciutto MORE than bacon. Eeeek! Is that sacrilege? You could put that balsamic glaze on a shoe and it’d be good… but I’d prefer it on this pizza… so scrumdiddlyuptious my friend! Ugh, this pizza killeth meeeeh. I’m not a big asparagus fan but I can definitely get on board with this balsamic glaze. Some of the best pizza recipes are when random things are piled on top! This pizza looks great and it was WAY TOO LONG since your last pizza recipe. That balsamic glaze looks amaze I want to drizzle it over all my food today!! Balsamic glaze on anything is delicious! Especially on pizza. I once made an eggplant and roasted red pepper with balsamic glaze pizza and it was heavenly. Love your asparagus/mushroom twist on it! I’m sold on almost anything that’s got balsamic glaze…I’m surprised I don’t drink the stuff. Portobella mushrooms and asparagus are two big favorites of mine also, so this pizza is right up my alley! I totally love your Thai Chicken pizza recipe and then tried the Greek Pizza which was amazing but takes forever to make, but totally worth it!! Now I have to try this one – YUM!! Prosciutto + PIzza? Count me in. Plus I’m still trying to use up a bottle of balsamic glaze I bought at Trader Joes. Looks like I’ll be making this soon! I know what we’re having for our next pizza night! Our weekly pizza nights have yielded some pretty good results, one of my recent favorites was bacon, jalapeno and pineapple. Can’t wait to try this! The link is just fine :) love the pizza recipes.. keep em comin! I love pizza recipes! It feels like such a fancy dinner when it’s so simple to throw together. With balsamic this sounds delightful! Fab spring recipe with great flavors and seasonal produce! Love it! Oh. My. Goodness. You make the best pizzas, but this one looks especially amazing. Looooving the balsamic glaze! This pizza is making me drool! I love asparagus, and I love pizza. This is the recipe for me, thanks! delicious.. i love mushrooms and asparagus. This pizza sounds amazing and looks so pretty too! Just the link is great :) No need to overwork your fingers with all that typing every time! They’ve already worked overtime in making this delicious pizza!! And by the way, I just made your funfetti cupcakes… Ah-mazing. Tell those fingers to keep up the good work. I’m drooling. I love the glaze of balsamic and I love the way the cheese looks! I make a loaded focaccia with caramelized red onions, piquillo peppers, kalamata olives and goat cheese. 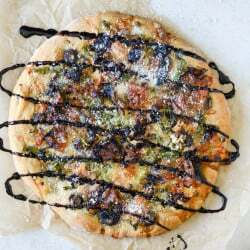 I’ve always just drizzled it with pesto, but your balsamic glaze is sheer genious! Will definitely make that soon…thanks!! THIS LOOKS AMAZING! I seriously cannot wait to make this. 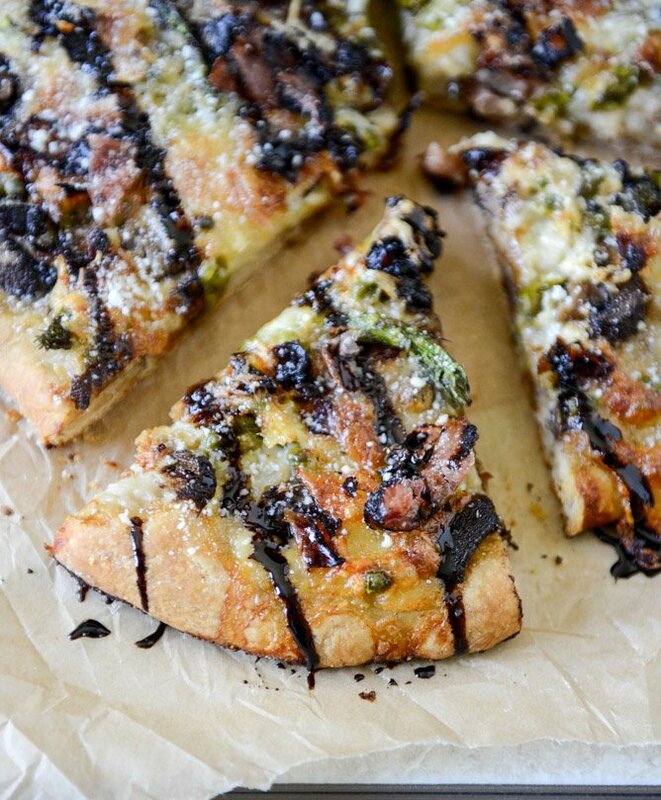 My boyfriend and I make a caramelized onion pizza with a balsamic glaze, so this is right up our alley!! I’m not even hungry right now and I just want to gorge on that pizza!! I love a good pizza – I’ve been thinking about buying a pizza stone! Does it make much of a difference? do you use one? ps. linking the recipe is good! made this last night (veg style) and it was soooo good!! Thanks! This looks amazing and I love asparagus, I can’t wait to try it. That balsamic glaze looks amazing…currently drooling at those pics! Have a listen to Yael Naim’s rendition of Brittany’s ‘Toxic’ – very cool take on it! I Want My Pizza That Way! Ok lame Backstreet Boy reference, but only because I rock out to that on my Pandora too :-) Seriously though, this pizza looks amazing! I would actually prefer… if you flew out to California and made this pizza for me, tonight. I’ll give you wine! and sprinkles.